This was Noah after our long weekend. 2. His shorts are semi-wet still from swimming in Mona Lake after baseball all day. 3. His arms are in a very peculiar position. I wonder what he was doing when he fell asleep. 4. He still has chocolate sundae on his face from our treat for the ride home. But I feel as tired as him today. I stayed up a little too late last night. If you saw my post from yesterday you could see the project I was working on. I started it a little late. 10:00pm. Scott wanted nothing to do with it. He wanted to relax a little and then head to bed. He told me it would take a couple of hours to put my project together. I scoffed at him. I bought a kitchen island for my birthday. I envisioned building something or buying something made from reclaimed barn wood. But I went for practical and got something NOW that can make more storage for our sad little kitchen. I was tired of having the silverware tray sitting on top of the cabinets. It looks and feels so much better now. 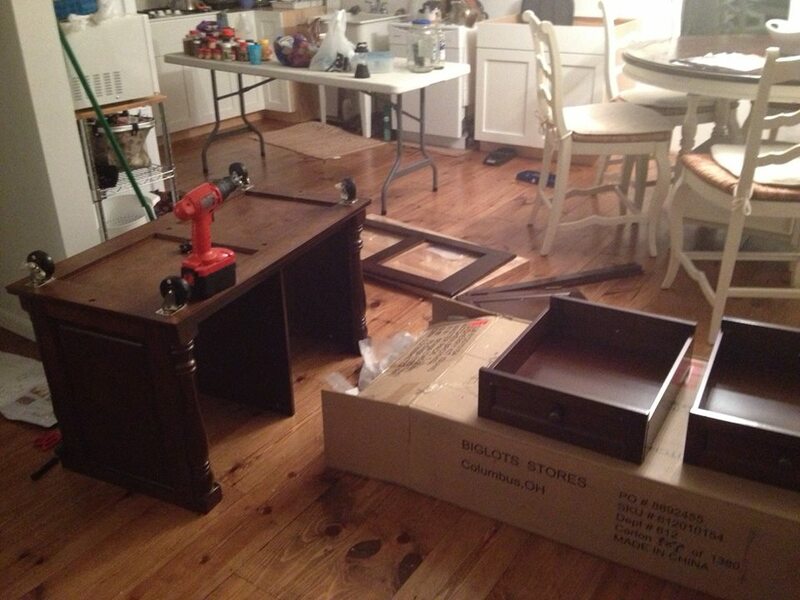 The folding table was no longer working as an island (but we were so grateful for it B & K!). It is so porous that any spill would get sucked into the table never to be removed. Not really but it was difficult to keep clean. A work in progress still, but much improved. ...and get rid of the utility sink. Although I've been loving how high it allows me to pile my dirty dishes..haha. Now my utensils have a drawer. The boys were a little confused, but they'll get used to it. Another view. And another step closer to a functioning kitchen. I'm loving it. Now to take a nap.